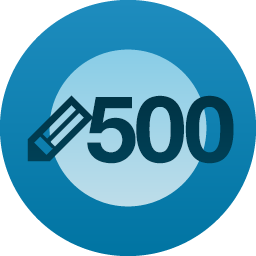 I’ve posted 500 times since I started my blog. Back in July 2014, it was hard to believe I would have written that much, but I have and I’ve loved every minute, every word, and every photo I’ve chosen to share. But where do I go now? Of late, I have been so busy with other tasks I didn’t even realise I was approaching this monumental blogging milestone. Beyond setting up our new home, I’ve also been trying to find a job and this takes up a lot of my time. Writing job applications, submitting them and crossing my fingers, hoping I’ve not made any misatkes or tpyos (ha, ha – just kidding). But job applications are hard work and time-consuming. Then there are the interviews, though I must say I’ve not had too many of them. It’s not always the case that you hear back from a prospective employer no matter how good your application is, or how perfect you think you are for the job – or visa versa. To be perfectly honest, when it comes to my blog I feel that, for the first time, I’m struggling. I’m struggling to find inspiration, struggling to find time, though while I am being perfectly honest, there is always time. What I am struggling with is finding a new direction. I feel as though I need something new to write about, but what that is eludes me like the last tendrils of a dream that drifts away as the first light of a new day draws me into consciousness. I feel it right there on the edge of my mind, but like wafting smoke, I’m unable to grasp it. Hopefully I find it soon and continue to share my thoughts and creativity. Hopefully before I know it, I’ll be racking up post number 1,000. By all means, if you have a suggestion, please leave a comment. Congratulations on your accomplishment! Happy continued blogging with a hug & a blessing added for your endeavors yet to be!! Sorry about the typos. Working from my phone while at sea. Good luck with the job hunt! I’m sure the right thing will turn up. And yes – the right job will turn up. Writing about what’s next could be interesting. You know, the second half of life, how you’re binding your way, what you are learning. That’s something many people are grappling with. Of course, some of are clising in on the final quarter, if I’m being honest.